This remarkable book deals with the border between philosophy and theology and asks a question that Stephen Mulhall (2001) also poses at the end of his book Inheritance and Originality and leaves unanswered, namely, “[C]an philosophy acknowledge religion and still have faith in itself?” Falque argues very much in the affirmative and a repeated slogan of the text is “the more we theologize, the better we philosophise”, that is, philosophy finds its rightful place when it engages with theology and then returns to its own land of ‘the human per se’. In this book Falque is dealing mainly with the theological ‘turn’ in French phenomenology and what we are to make of it, but it will be of interest in this review to see if his arguments hold for the wider terrain of philosophy. In what follows I shall look at Falque’s contestation that philosophy can be transformed by a confessional faith and still remain philosophy. Is there really room here for an exercise of reason that is not an employment of it on one side or another of the existential choice with which Christianity faces us? What seems to be missing here, and what Falque is very much aware of is that philosophy is never done in a vacuum. To take a hermeneutic approach for a moment, there is always, as Heidegger (1962) states, a fore-concept before the analysis begins and this is then where the enquiry starts from. If this is the case then the most intellectually honest way of proceeding is to make this fore-conception transparent. And so if you are philosophizing from the standpoint of someone with a confessional faith it is best if this faith is given an airing at the start to make the reader aware of the type of human life you envision and are trying to elucidate. 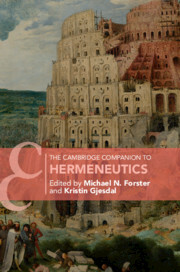 Falque makes this point by looking at the Protestant hermeneutics of Ricoeur and the Judaic hermeneutics of Levinas before positing his own Catholic hermeneutic and what this allows us to see is how a confessional faith can help to make salient certain aspects of the philosophical enterprise that may be obscured from a primarily secular starting point. The life a person leads undoubtedly permeates their philosophy and although philosophy should be solely based on reason, the experiential ‘content’ given through a lived faith and the motivation, in terms of the mission of the philosopher will transform the subject matter and methodologies employed. This does not mean the resulting philosophy will necessarily be edificatory, but rather certain evidence, premises, topics and intuitions will have salience above others in the work of a philosopher with a confessional faith and this will not invalidate the philosophy by itself, but a self-aware philosopher would do well to make transparent how her faith informs her practice. The beautiful: that which we do not want to change. The good: not to want to change it, in fact (non-intervention). The true: not to want to change it in one’s mind (by means of illusion). The good — not to want to change what? My place, my importance in the world, limited by my body and by the existence of other souls, my equals (Weil 2004: 38). He remembered waking once on such a night to the clatter of crabs in the pan where he’d left steakbones from the night before. Faint coals of the driftwood fire pulsing in the onshore wind. Lying under such a myriad of stars. The seas black horizon. He rose and walked out and stood barefoot in the sand and watched the pale surf appear all down the shore and roll and crash and darken again. When he went back to the fire he knelt and smoothed her hair as she slept and he said if he were God he would have made the world just so and no different (McCarthy 2007: 234). Here the character describes an experience through which he is willing to affirm the whole world as it is. In such experiences we are able to ‘see’ the world as ‘good’, as God is said to have done in Genesis. These experiences allow us to affirm that there is a value to life and living, and, indeed, we are able to affirm the value of our own existence because it is only due to the fact that we exist that this consummation experience (of perceiving the goodness of the world) is possible. Where does our investigation get its importance from, since it seems only to destroy everything interesting, that is, all that is great and important? (As it were all the buildings, leaving behind only bits of stone and rubble) (Wittgenstein 1963: §118). If ‘the destruction of anything interesting’ is all this methodology of philosophy can achieve, why should it claim any of our attention? Wittgenstein’s answer is that ‘the aspect of things that are most important for us are hidden because of their simplicity and familiarity’ (Wittgenstein 1963: §129). The disappointment we feel at the humble task of philosophy is a hankering after the facility and seeming profundity found in fantasy. In order for us to see ‘the aspect of things most important for us’ it is necessary to find ways of exalting in the ordinary and recovering the hidden beauty therein. One way of tackling this problem of familiarity can be found in art, but also in religion. In Catholicism, the sacraments involve taking some everyday activity and relating it to the divine. For instance, in the sacrament of Communion the value of sharing a meal is celebrated with all the related values of family and friendship. In Confession the process of repairing a relationship is connected with our relation to the divine. In all religions the life of the community is understood as bound up with the eternal. In this way everyday practices are transfigured and thereby their value as part of a life is re-presented (reflected back to the community) in a new light and reaffirmed. This reaffirming of the everyday is found in Wittgenstein’s philosophy where we are invited to pay careful attention to our life with words and how this is inextricably bound up with our form of life (thereby taking our anxieties about language and showing how they express anxieties about our lives). Wittgenstein’s writings focus our attention on the conditions of the human relationship to the world and others, and help us to recognise that the wish for depth in our understanding of things is inherently empty. Such a recognition is one way in which we can overcome artificial craving to go beyond the everyday. The words of this philosopher allow the familiar to become strange and enticing and thereby reignite our interest in the ordinary. Through the ordering of his words the ordinary is transfigured and our poor substitute fantasies can be left behind for a time. If we examine the general laws of perception, we see that as it becomes habitual, it also becomes automatic. So eventually all of our skills and experiences function unconsciously – automatically. If someone were to compare the sensation of holding a pen in his hand or speaking a foreign tongue for the first time with the sensation of performing this same operation for the ten thousandth time, then he would no doubt agree with us. It is this process of automatization that explains the laws of our prose speech with its fragmentary phrases and half-articulated words…If the complex life of many people takes place entirely on the level of the unconscious, then it’s as if this life had never been. And so, in order to return sensation to our limbs, in order to make us feel objects, to make a stone feel stony, man has been given the tool of art. The purpose of art, then, is to lead us to a knowledge of a thing through the organ of sight instead of recognition. By ‘enstranging’ objects and complicating form, the device of art makes perception long and ‘laborious. (Shklovsky 1991: 5-6). It is by creating a space in our workaday activity (by making the task ‘harder’ than it might normally be) that can release us from ‘enslavement’ to habitual practices. This disruption enables us to carry out projects in ways that interweave spontaneity into the rhythm of the task we are engaged in. This practice in philosophy of trying to ‘transfigure the ordinary’ for the reader can be seen as a practice adopted from a perspective of a confessional faith without overstepping the boundaries of the ‘human per se’. I believe this is what Falque is aiming towards and if it seems an important practice is worth defending. Mixing theology and philosophy can be seen as a path inherent with dangers that may mean that others convict you of not doing philosophy at all. Crossing the Rubicon is an important book in that Falque attempts to cross the stream between these two disciplines to eventually return and know philosophy better. It would seem his crossing is successful and that he does remain a philosopher in the end and I have tried to outline the practice within philosophy that he follows that has confessional roots but conforms to the boundaries of philosophy. The book is a testament to being honest about your motivations and trying to find a way to carry on in a discipline bound by the ‘human per se’ while being inspired by the divine and highlights an overwhelming need in philosophy for the recognition and the acknowledgement of the personal as an necessary partner of the rational. Cavell, S. 1979. The Claim of Reason: Wittgenstein, Skepticism, Morality and Tragedy. Oxford: Oxford University Press. Falque, E. 2016. Crossing the Rubicon: The Borderlands of Philosophy and Theology. trans. R. Shank. New York: Fordham University Press. Heidegger, M. 1962. Being and Time. trans. J. Macquarrie and E. Robinson. Oxford: Blackwell. McCarthy, C. 2007. The Road. London: Pan Mcmillan Ltd.
Mulhall, S. 1994. Faith and Reason. London: Gerald Duckworth & Co. Ltd.
Mulhall, S. 2001. Inheritance and Originality: Wittgenstein, Heidegger, Kierkegaard. Oxford: OUP. Shklovsky, V. 1991. Theory of Prose. trans. B. Sher. London: Dalkey Archive Press. Weil, S. 2004. The Notebooks of Simone Weil. trans. A. Wills. London: Routledge. Wittgenstein, L. 1963. Philosophical Investigations. trans. G.E.M. Anscombe. Oxford: Blackwell Publishers Ltd.
Alferi, T. (2007). “Worüber hinaus Grösseres nicht ‘gegeben’ werden kann…” Phänomenologie und Offenbarung nach Jean-Luc Marion. Freiburg: Alber. Marion, J. (2000). “Eine andere ‘Erste Philosophie’ und die Frage der Gegebenheit.” In Ruf und Gabe: Zum Verhältnis von Phänomenologie und Theologie. Her. J. Marion, J. Wohlmuth. Bonn: Alfter: Borengässer.